Kitchen! Kitchen! : gravlax and avocado tartare......at kitchen! kitchen! 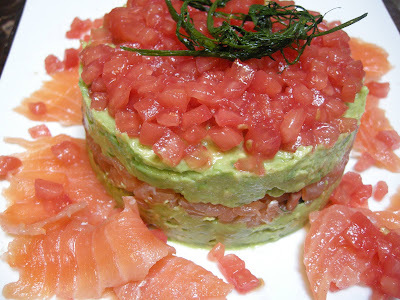 gravlax and avocado tartare......at kitchen! kitchen! This is a takeoff of my previous posting dated 6/12/12 "Avocado Gravlax Cake"
avocado and diced tomatoes to serve as an appetizer that would serve six. Follow the previous recipe and triple the ingredients for a 4-1/2" diameter mold. Your family and friends will love it! (You may use store bought smoke salmon instead of gravlax).